A website of an organization or a person is like the online image. It doesn’t even matter nowadays that what business you are in because at the end of the day, your business is an internet business. When people want to search for products or services, the web is the first place that they and it will probably be the last place too when they are to make a purchase decision. Everyone is in the race to make the most appealing website because that would also attract traffic. If you look around, you will find the internet filled with web builder websites. It is no doubt that they are cheap and attracting, but after all you will always get what you pay for and that goes especially for the lead generation websites. But when you are a business asset, it will be your biggest mistake if you want to go cheap. You will be able to get a very attracting website but there would be much less likelihood of being it Google friendly and it will certainly not become the company’s marketing engine, which should be your priority. All of this would mean that your site won’t be ranked in search engines and it won’t make it to find potential customers. It should all be sounding alarming to you because the stakes are that high. There is no harm in getting a pretty website but SEO strategies are way more important to be put in place and increase your chances for organic ranking potential. Your goal should always be to create an optimizing marketing platform, which would attract the traffic and eventually convert it to sales. With each passing time, it has become more difficult to come up with and create the marketing strategy. Back in the day, creating your website was just to make sure that you have your first-page real estate. The channel you are using doesn’t matter as long as you don’t know your customer, develop a brand proposition and then communicate it effectively too. The fundamentals of marketing have remained unchanged, regardless of the changing times. Even if search engines are doing all the shaabam for you but, still one would require content to determine if a customer will do a business with you or not. You will not only be judged by the search engine, but also by the internet. Lacking an extremely efficient marketing strategy to back it all, will never let you succeed in the search engine optimization. It should always be kept in mind that a website alone is not a marketing strategy but it is just part of the marketing plan. For an effective marketing strategy, the first step is to always know your audience. Who are the ones that you are targeting? What is the type of content that you audience would like to see or consume? And most importantly, what are the goals that you want to accomplish with the website? Some of the reasons for the need to create a website are; lead generation, more visibility, and more sales. It can also be a combination of all the mentioned above. Moreover, work on creating brand proposition, what is that your brand is offering which is different? It should be so clear that when the customers visit the website they should know why they want to do business with you. You must have noticed that whenever you want to buy something, you would always type it in the search box and that is how the online purchase begins. Keyword research is so crucial and it results in high return activities in the search marketing industry. It can break or make your website if you are able to be ranked for the proper and right keywords. You can get traffic on your website, but keywords research will make it sure that you are getting the right visitors on your website. Google AdWords planner is the most valuable weapon in SEO. It is the advertising system which is used by Google. It is free and anyone can use but the key here is to use it in the right way. You will have to come up with the right keywords and phrases which will go with your website. 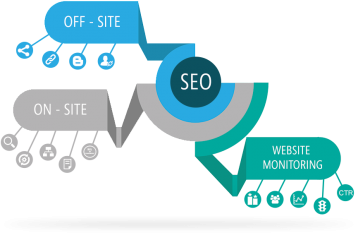 On page SEO helps to optimize the structure of the page in such a way that it will make it more feasible for the traffic to find the keywords that you have targeted. You can always take help from a content management system like WordPress and can very well check if you are getting the traffic. Just make sure that you have selected the option “Allow search engines to index the site” which will be under “Site Visibility”. Apart from WordPress, there is Google Webmaster tool too which can give you a nice view if it is being crawled. The body of your website page is most crucial and you should include the keyword(s) in that at least four time. If you are adding images then always add the keywords in the alt tag. And make sure that it is relevant to the image. The page title is what appears in the tab of the web browser which is being used. So always create something which is very enticing. Include the keywords in the meta tag which can be seen under the page’s title in the search result. The h1 tag is completely different from the meta tag and always put keywords in it but as close as possible to the front. Last but not the least, you can also include the keyword in the URL slug. It is never too late to take the right steps on your website. Your website can be on the top of the ranking but still you can always apply the top recommendations and adjustments to ‘give it a notch’ to your website ranking. Ashar Khalid is an Executive in an immigration company and represents the Caribbean Citizenship immigration program for the firm. His passions and hobbies include blogging and making vlogs. He has done his Masters in Marketing and have been writing since he was starting his Bachelor’s. Ashardoesn’t like to be limited to just one topic or industry when it comes to blogging, but he likes to cover the different aspects of different industries. He has written blogs on technology, food, healthcare and travelling. Since his profession of study is Marketing, he has done most of the writing in the Marketing and Sales field. How to Write a Successful Multilingual Blog?